As odd as it may sound, there’s little to report when it comes to driving a fuel-cell vehicle. Quite frankly, if you’ve driven a fully-electric car in the last three or four years, you’ve essentially experienced what it is to drive an FCV, with a few distinctions, of course. Let’s begin by very briefly clarifying what an FCV is: It’s an electric car that, instead of hauling about batteries as a source of power, carries with it one or two or more high-pressure hydrogen tanks on board. Both types of vehicles deliver emission-free driving, whisper-quiet operation and a huge sense of doing some good for the environment. Both of these technologies share very similar goals and have their share of obstacles. The 2018 Honda Clarity FCV’s polarizing exterior design could be one such obstacle. However, this early in the process of introducing fuel-cell technology to the masses, it is not. The Clarity, and plug-in hybrid versions, are conceived as such for maximum efficiency. They are also designed and aimed at a very specific target market. In other words, only qualified early adopters of this technology will be able to get this car. That means that unless you live in specific regions of the world, the car is not for you. Sliding aboard reveals a roomy cabin that could just as easily find its way in an Accord. Here, we come across one of the notable obstacles. The main hydrogen tank is located in the trunk and thus chews up depth in what otherwise would be a large boot. Until the shape of the tank evolves into something else, this is will always be a problem. There is no period of adaptation required to run an FCV. This is perhaps its greatest asset. In an ideal setting, a Clarity user could cover roughly 585 km (its current full range), stop and refuel with hydrogen as needed in a few minutes, and be on its way. 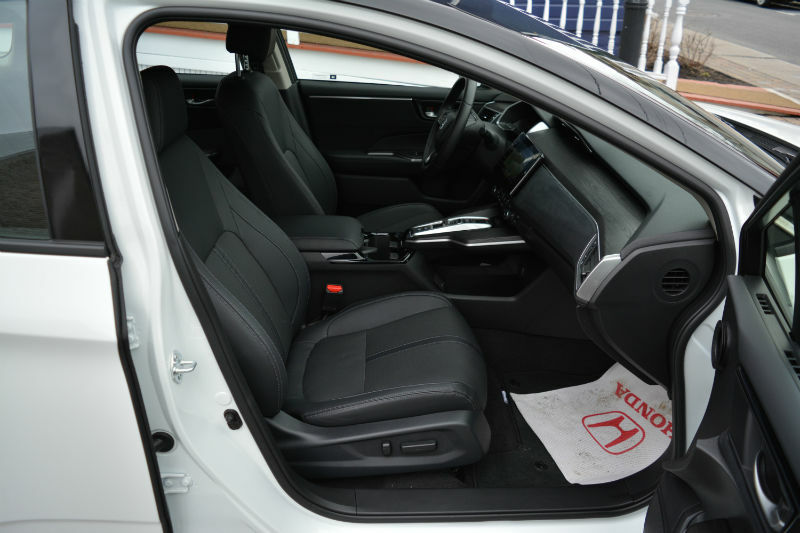 Outside temperatures and the use of electric accessories does not impact range, or no more than they do in your Honda Civic. The opposite is true with battery electric vehicles. As I mentioned, driving the 2018 Honda Clarity FCV is like taking an older electric car for a spin. I specify older because the Clarity is not as quick as say the 2018 Nissan LEAF. The combined weight and electric motor output see to this difference. Despite the provided 174-horsepower and 221 lb.-ft. of torque, acceleration is lazy off the line. There is a “sport” drive mode which modifies throttle mapping ever so slightly somewhere in the mid-range. 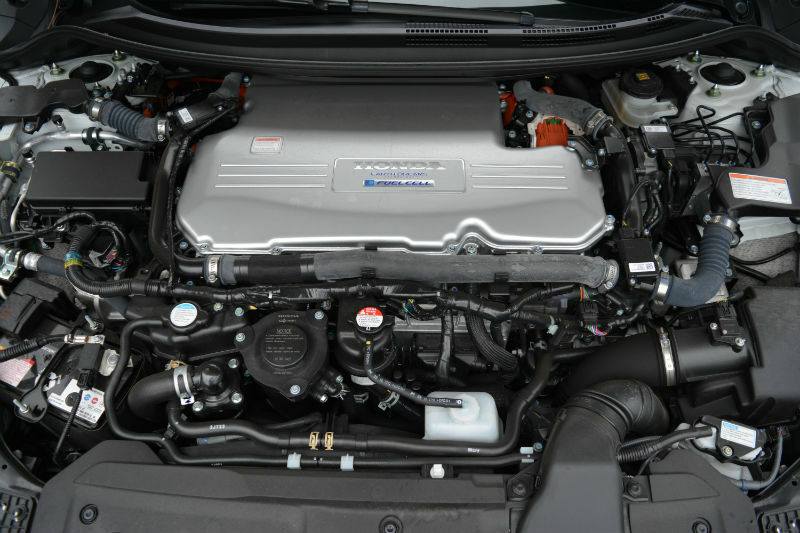 Interestingly, the fuel cell powertrain is roughly the same size as a 3.5-litre Honda V6 engine. This is an improvement over previous powertrains which were much larger and would not fit under the bonnet of a typical midsize automobile. I was curious to find out about maintenance requirements for the Honda Clarity FCV but the only answer I got was that all servicing is included in the 3-year lease plan. This brings us to actually getting a Clarity FCV in Canada. You can’t. At least, not yet. If you live in California, you can. The only way to leave a dealer lot with a Clarity is by signing a 36-month lease priced at $369 per month with $2,868 due at signing. Included in the lease is a 20,000-mile per year allowance, up to $15,000 of hydrogen fuel, and up to 21 days of access to a luxury vehicle from Avis while in California should you ever want to drive out hydrogen refilling station range. 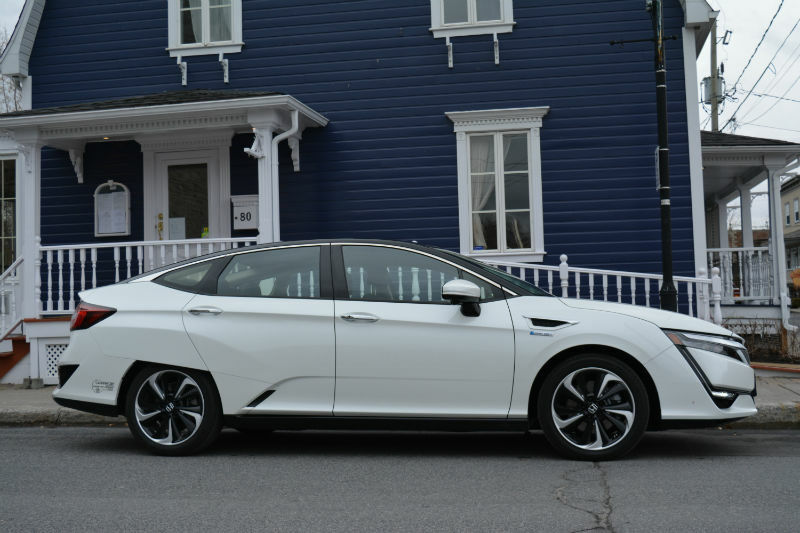 I can tell you now with near certainty that when, and if, the Honda Clarity FCV comes to Canada, the deal won’t be as sweet. If we take a moment to the EV’s major shortcoming, we find both the limited and climate-variable range and the time required to recharge. I’ll add “and, that’s it” to this list. From my cozy home in the Greater Montreal Area, in the Province of Quebec, considering an FCV is like stepping back 5 or 6 years in time to when EVs were all new. There was little or nothing for them at the time. Today, Quebec has a vast and rapidly expanding charging network that is plugged into our clean, renewable and relatively inexpensive electricity. By the time FCVs catch up to today’s EV, electric cars and utility vehicles will more than likely sport 500+ km ranges, have far reduced charging times and benefit from a huge network of stations (in the most populated regions of the country). As well, with greater sales, unit prices will drop making the cars more affordable. There will be more models and body styles to choose from too. The major advantage to EVs is that they can be charged at home. In the very near future, intelligent charging will remove nearly all, if not all, human involvement in plugging in once we get home. This will never happen with FCVs. While range is important, the average daily Canadian commutes 45 kilometer to and from work. As good and brilliant as the Clarity FCV is, I wonder about hydrogen stations, the “creation” of hydrogen and the transport of hydrogen. Seems to me that an H2 filling network of stations will require far more work, be very expensive and have a greater impact on the environment than simply jumping on the already established grid. Like fuel, transports trucks will be needed to deliver hydrogen to the majority of stations. They’ll probably run on hydrogen and this brings me to where I think FCVs will work: in fleets. Transportation companies of all kinds (UPS, taxis, etc.…) have hubs where refueling stations could easily be setup. I fell as though I’ve only barely scratched the surface of the EV vs. FCV debate. We need to remember that governments are heavily involved and that they have to power to influence. I’ve said it before and hear I go again: We live in very interesting automotive times.